Official opening of OzGrav in Melbourne. OzGrav supports the Zadko Telescope and Multimessenger Astronomy. The newly formed Faculty of Engineering and Mathematical Sciences releases a flyer on the Zadko Telescope. Airbus Safran Launchers establishes a space situational awareness (SSA) facility within the Zadko Observatory. Summer student Gavin Siouw explores a simple model of space debris evolution. Work started to develop a backup control system for the Zadko telescope. Dr David Coward becomes a Chief Investigator of OzGrav. The Zadko Telescope joins with Swinburne University's Deeper, Faster, Wider (DWF) project to discover and monitor the fastest astronomical transient events. The Zadko Telescope is used to follow up the most interesting of these phenomena. ARC announces it will establish a Centre of Excellence called OzGrav for Gravitational Wave and Multimessenger Astronomy. UWA will be one of the nodes of this centre. PhD work by Damien Turpin at the University of Toulouse to follow up neutrino events detected by the Antares neutrino telescope in Europe. A new Andor IKON-L DW 936N CCD astronomical camera is installed. The Zadko Observatory reopens in a new Roll-Off Roll-On Observatory Building, controlled by a Programmable Logic Controller (PLC) designed and constructed under contract by l'Observatoire de Haute-Provence (OHP) staff. Senior Technical Officer John Moore receives a Federal Government Endeavour Executive Award for international travel to gain expert technical knowledge and examine best practice in the principles and process of large telescope optical cleaning and aluminizing by visiting Observatoire de Haute-Provence (OHP) Saint-Michel Observatory - France, Gemini Observatory (North) Hawaii and DFM Engineering Optics laboratory Colorado, USA. Decision made to replace Sirius Dome with a new custom built Roll-Off Roll-On observatory. Zadko telescope will provide follow-up to the ESA GAII satellite for the discovery and study of transient astronomical sources. Sirius 6.7 metre fibreglass dome starts to experience operational problems. First imaging of space debris (including the defunct Australian Fedsat satellite). Dr David Coward, Director of the Zadko Telescope receives an ARC Future Fellowship for Multimessenger Astronomy. Dr Myrtille Laas-Bourez from Observatoire de Haute-Provence (OHP) commences a one year post-doctoral fellowship. The Zadko Telescope was the first telescope on Earth to detect light from a massive gamma ray explosion 11 billion years ago. First light for the one metre f/4 Cassegrain Zadko Telescope with Andor IKON DW 436BV camera housed in a Sirius 6.7 metre fibreglass dome. 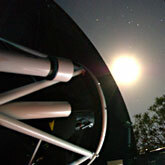 Australian Research Council (ARC) linkage grant awarded to UWA to work with the Observatoire de Haute-Provence (OHP) France for the construction of a robotic telescope to form part of the TAROT network. Philanthropic donation to the UWA by businessman Jim Zadko (CEO of Claire Energy) to establish a large optical telescope at Gingin 31.357 degrees south and 115.714 degrees east. Further enquiries regarding recent developments of the Zadko telescope may be directed to the Executive Director.